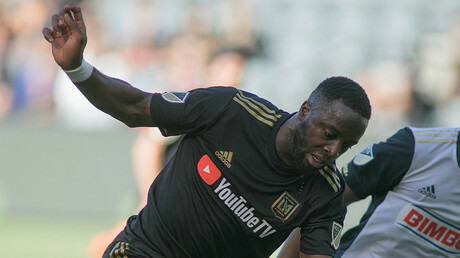 MLS player Adama Diomande says he was racially abused while playing for Los Angeles FC against Portland Timbers in the US Open Cup on Wednesday. Diomande, who has formerly played at Hull City in England, claimed he was called the n-word in the 3-2 victory against Portland, adding it was the first time he had been racially abused on the pitch in his decade-long professional career. The 28-year-old made the statement about the slur on his Instagram account, with the post accompanied by a black square. The accompanying message read: “Today was the first time in my professional career that I was called the «N» word on the field. They will say sorry to me after the game and please let it go, but If I don’t say anything racism will just continue to grow. Diomande was born in Oslo, Norway, to parents who hailed from Ivory Coast. He has made 11 appearances for the Norwegian national team, and moved to Los Angeles FC in May, having spent three years in England with Hull City. His earlier career saw spells at Dinamo Minsk in Belarus, as well as clubs in his homeland. MLS is yet to comment on the alleged incident.